Yesterday I broached a bit of a controversial subject as I started discussing the “W” word. 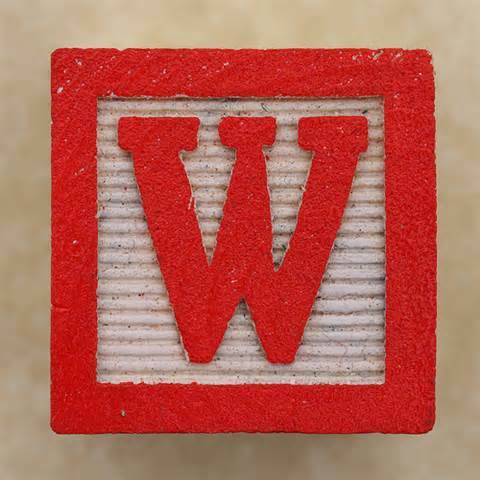 “W” as in walking. To some runners, walking during a race is no big deal and even a good thing. Others, however, might consider it a sign of running inadequacy. You can check out “The ‘W’ Word, Part 1” here. I ended yesterday’s post with a “Check in tomorrow,” as I teased that walking can actually make you a faster runner. You heard me right. Walking can indeed help you improve your race times. And this is no internet hocus-pocus where they promise results if you do exactly the opposite of what makes sense. How can you get faster by going slower? The answer is simple… employ a run/walk ratio. For those of you not in the know, this is often referred to as “The Galloway Method,” made popular by its most well-known proponent, famed runner Jeff Galloway. Yes, I am a student of the “Run-Walk-Run” interval strategy. And it has worked very well for me. Now, I’m not asking you to step right up, put on a hooded robe with running sneakers and drink the spiked Kool-Aid. Just hear me out and decide for yourself. It doesn’t have to be one or the other, does it? 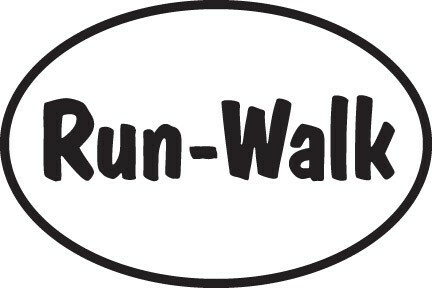 First off, for those of you who want to read in-depth about the run-walk-run method, check out the link to Jeff Galloway’s website right here. The way it was explained to me was unless you are an elite runner, you can improve your race time by incorporating a run/walk ratio, basically meaning you run a certain number of minutes and then walk for a minute. In short, running a race with built-in walk breaks can actually give you a faster finish time than if you try to run the entire race non-stop. When I first started running marathons and half marathons back in 2008 I employed a 3:1 ratio (run for 3 minutes and then walk for 1 minute); I’m currently at a 6:1 ratio (run 6/walk 1). I did my last half marathon (the Hollywood Half Marathon) running a 5:1 ratio, meaning that I was walking 1 out of every 6 minutes… or 10 minutes of each hour (aka 16.7%). Or you could say I ran approximately 83.3% of the time (depending if you are a half full or half empty kind of runner). Let’s all be Bangles, shall we? I ended up with a time of 2:03:14 and placed in the top 28% of runners… not too shabby for someone who walked for 20 minutes during the race. Still a doubting Thomas or Tina? Here’s why taking periodic walk breaks during a race can help you (as best as I can explain in the limited space of a blog post). You delay the onset of fatigue as you can recover during the break, conserving energy for later in the race. 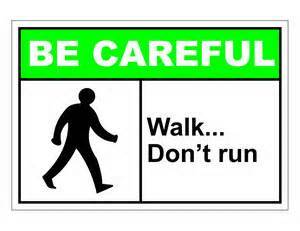 Walking also focuses more on different muscles than those utilized heavily when running, also lessening your fatigue. And you actually don’t lose that much time by walking for a minute (only about 15-20 secs depending on your pace). Remember, you’re still moving the entire time. And some people incorporate a bit of a power walk during the break to up their speed and maintain good form. And there is a mental component as well (distance running definitely incorporates a significant mental aspect). 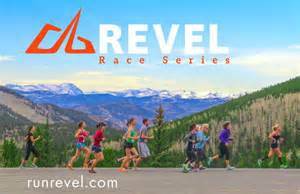 The run-walk-run method allows you to compartmentalize a race, by picturing it as a series of run intervals as opposed to the whole enchilada. What sounds more manageable, running 26.2 miles or running for 6 minutes? I remember running the Chicago Marathon in 2009 and hitting the wall at mile 20. I was hurting and wanting to stop, but I simply said to myself, “Run three minutes and then we’ll discuss it.” After three minutes I had my walk break. Then as my watch beeped ending my walk break I simply said again, “Run three minutes and we’ll discuss it.” By breaking the remainder of the race up into seemingly smaller chunks, I was able to stay motivated and keep on going. Ah, head games. Good advice when encountering zombies. The run-walk-run method also is great at helping you achieve a “negative split”… a goal for which runners should aim. It simply means that you run the second half of your race faster than your first half. The problem facing many runners is while they start off fast, their pace drops off as the race progresses and fatigue sets in. Often they’re barely hanging on when they stagger across the finish line. With the run-walk-run method you’re able to monitor your pace and energy a bit better, meaning a negative split is a more achievable goal. It does mean that you will take walk breaks early in a race (even before you’re tired) and you’ll have to get used to it. When I ran the Hollywood Half Marathon, I took my first walk break 5 minutes into the race. I watched as scores of people blew by me, some of them even shooting me looks. When I caught a disapproving glance, I just thought to myself “I’ll be seeing you again at mile 9.” And sure enough, come later in the race I ran by numerous people who flew past me in the early going. And while some of them looked like death warmed over, I was still sporting the same goofy grin I had at mile 1 (as many of you know, I naturally smile when I run). One from column A and one from column B. So what does this all mean? 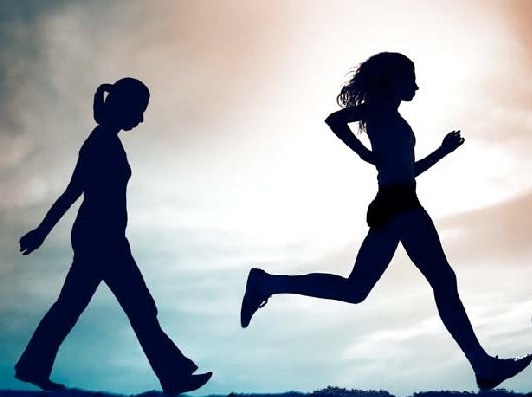 That the run-walk-run method is the end-all be-all running strategy and anyone not utilizing it should abandon their running plans immediately and jump onboard? 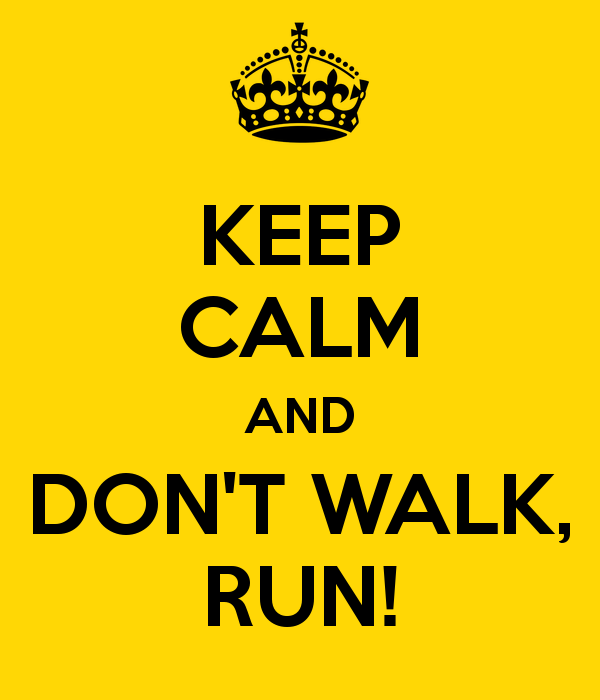 The run-walk-run method works for me, numerous running friends of mine and a multitude of other runners out there. I do also have friends who are completely opposed to it and have told me I should give up the run/walk ratio. And there are plenty of runners out there who are quite comfortable with their current running styles and wouldn’t change them for all of the Gu Chomps in China. Just like the minimal shoe vs. traditional running shoe debate (or Coke vs. Pepsi for that matter) there will always be people in each camp. I am a complete supporter of “do what works for you” (each person is different). But if you’re just starting out running or dissatisfied with your current running program, you could do far worse than to look into the run-walk-run method. Just remember that “walking” is not your enemy. In fact, during a race, walking might be the difference between just finishing and finishing with your best time ever. Run, walk… and Run on! Posted on June 18, 2014, in General and tagged Galloway Method, Jeff Galloway, Negative Split, Run/Walk Ratio. Bookmark the permalink. 24 Comments. Love this topic. I fully believe in the run/walk method, although I don’t employ it at regular intervals. I usually walk between a quarter mile and half mile after each water stop (in a long race). And totally see the benefit of walk breaks! After reading this, I might try more regular intervals. I know many people who utilize water stops as their spot to start walk breaks. And even though I have regular intervals, I do shift them at times to sync up with the water stops. I have been a Jeff Galloway fan since shortly after my first marathon, theCIM, back in 1999. I used the walk run method sporadically when I did the same marathon the following year and was 15 minutes faster. The third year, I walked for one minute every 10minutes and shaved another 15 minutes from my time. Now, in my early 60s,I would not still be a runner (half marathons only now) if I did not take walk breaks. Thanks so much for your posts on this subject, as well as the poop part. I burst out laughing when I read that part!!!! Yay for poop! I’m a huge Galloway supporter and hope to see him at the Peachtree Road Race (he won the very first one). Keep on running (and walking) and thanks for reading. Damn, getting you to drink the Kool-Aid. If you’re interested, you might want to give his book “The Run-Walk-Run Method” a look (no, I don’t get kickbacks) or one of the other books that cover the subject. I wish I was running SF (I’ll probably do it next year) and want to hear how things go with you. Also, I will say, for anyone considering trying the Galloway method, that it’s hard to go back. I had completed C25k before I ever started intervals, so I was able to run at least a half an hour (although not fast enough to complete a 5k in that time, sadly), and now it’s like torture to go beyond my normal run interval time, even if I’m only running a mile. However, the run portions of my intervals are much, much faster (hence my not being able to sustain them like I could when I ran more slowly) and my overall time has improved, as well. I’d go ballistic with the air quotes. As for taking that first walk break, I inevitably see some joker giving me a snicker and I remember their face… and then if I pass them later in the race, I flash a “remember me” smile. I haven’t tried to go a whole race without taking walk breaks, although I have done races where I’ve stopped taking walk breaks in the last mile or two… but that’s because I’ve conserved my energy by running smart and also taking walk breaks earlier on. My very first marathon I trained at a 10-min pace, which meant a 6:1 ratio. I actually ran the first 18-20 miles of the race at a 3-4:1 ratio (I was using music cues on my iPod to tell me when to take a walk, so the time varied), then ran the rest of the race straight through with only two short walk breaks. I clocked in at 3:59:32, cutting 20 minutes off the time I would have had had I maintained the 10-min pace I had been training for. So yes, walk breaks do speed you up. And a training pace can bear little resemblance to your actual race pace. Very cool. And congrats on breaking 4 hours. I also adjust my run/walk ratio and pace between training and races. I know of several people who won’t accept that walk breaks can make you faster, even with proof like yours. Thanks for reading. Great set of posts. I started off with the c25k post like a few of the comments previously and got to a point where I could comfortably run 45-50 minutes for a 5k non-stop. Then I discovered Galloway and ran my first half marathon using a 1:1 ratio that had me finishing at 3:15. Since then I have grown faster and I am always experimenting with my run/walk ratio trying to find more of what feels the most comfortable. I have abandoned the set ratios and have found that right now 20 miles or less can be ran comfortably using a 1:30 run to 30 second walk. On hotter days and when I need longer rest I mix in 1:1 but I am very comfortable changing my ratio based on how I feel. I figure for now I will stick with a 1:30::30 til I stop getting faster at that ratio. In the past four months I went from 14:30 mpm to 12 mpm with that ratio. So the long and the short, find a ratio that feels comfortable and don’t worry about others using larger run to walk ratios. Good post. Thanks for reading and commenting. Part of the run-walk-run method is finding the right pace and ratio that works for you. I started at 3:1 and am now at 6:1, but I do adjust depending on the race distance and conditions. 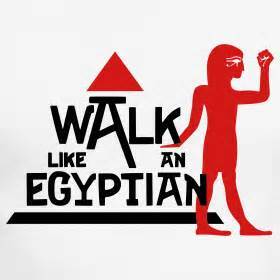 I have done it both ways, and I walk during times of almost every race. I just want to throw this out there. There is a great deal of evidence, especially from Furman that disagree with a negative split goal to a degree. They have evidence that states a consistent pace is the most efficient race. Of course, everyone is different. They do state that when you go out too hard you lose that speed 2 fold on the tail ened of the race. For instance if you run 5 miles of a 10 miler in 45 minutes and your muscles are only fit enough for a 10 min/mile pace then you will lose 10 minutes during the second half. The 5 min you gained plus an additional 5. Thats my two cents. Thanks for the post! Enjoyed it! Hi Joey… thanks for commenting. I have read the research that refutes the negative split in favor of a consistent pace. It is an interesting argument. For me I aim for the negative split because it forces me to not go out too fast at the beginning and I seem to have more energy left near the end. But it is something I’d be curious to research further. I just started doing the intervals as I’m training for the Dumbo and Dopey challenges. My time has slowed slightly, but I also attribute that to it being June in South Florida. I have found as I’m doing the longer runs 7+ miles, I don’t feel as “dead” at the end, even in the heat and humidity. My previous best 1/2 time was the Wine and Dine at 2:37 where I tried to run the whole thing and hit the “wall” around 10.5 miles, and just watched as people passed me. I’m looking forward to seeing how I do for Dumbo and some of the other halves (and Dopey) I have scheduled coming up later in the year. Thanks for reading Evan. I went to grad school in South Florida (Sarasota) so I know how crazy hot and humid it can be. You definitely will be impacted by summer weather, but your pace will increase once the temps cool a bit. Good luck with Dumbo and let me know how it goes. Great post. When I started running last year, I was committed to “pure” running. However, I was sidelined in the summer with a tonsillectomy and the Galloway method is what enabled me to get back to running. I am training for my first marathon, using run/walk intervals, and I am so happy it’s a method that works for me. Every runner is different, and, as they say, a 6:00 mile and a 12:00 mile is still, at the end of the day, a mile. I’m good with that. Thanks for reading… Nice to hear that the Galloway method is getting back on the pavement. What marathon are you training for? I hope it helps… anything to keep you running and happy. Please follow up and let me know how things go. And thanks for reading. I wasn’t going to post until I read the comment about Furman (my alma mater) and that you went to grad school in Sarasota (my home town). I thought the FIRST guys (two of whom were professors of mine) agreed with the negative split. Not as a goal per se but as a means to not go out too fast. Also, where did you study in SRQ? Hi Liz, thanks for the comment. The benefit of the negative split can definitely be argued… it’s something I shoot for (although not a huge difference between the two halves; just trying to keep from bonking). I actually went to FSU’s graduate film school, which from ’89-’95 was located in Sarasota at the Asolo Center (it’s since been moved to the main campus). I’m a film geek, so I was studying film/video production (what I do for a living out in LA). I lived in Bradenton while in school (right next door to the Nick Balliteri Tennis Academy). Hi Scott, I’ve just discovered your blog after Jeff Galloway shared a link to The ‘W’ Word part 1. You must be pretty proud that it was shared via his FB page 🙂 I’m a huge fan of his! I live in the UK but most of my running friends are based in the States; being a huge Disney geek I got into this running lark via the RunDisney events. I completed my first ever half marathon at the WDW Marathon this January and I couldn’t have done it without the Run Walk Run method. Like several others I started running with the C25K programme but as soon as I hit running continuously for 20 minutes or more I developed knee pain. I changed my trainers, adopted the Galloway method and have had no problems since! The Galloway method is virtually unheard of in the UK. People look at me so strangely when I start walking after the first 3 or 4 minutes of a race. I really feel uncomfortable. I want to shout out “it’s okay, I’m not struggling, this is a professional method, by an Olympian no less!!!!”. Thanks for the note and letting me know about Galloway sharing it (I didn’t know). I know how you feel about walking early in the race, but it’s nice to know you’ll still be going strong come the end. I’m glad you enjoyed the post… keep on walking and keep on running.